Wish-Bone® salad dressing flavors contain almost 200 different ingredients. From thousands of pounds of pickle relish to tenths of a pound of flavoring, each formula brings a new material management challenge. Pinnacle Foods Group requested a batch-driven method for ‘kits’ to be created, inventoried, and consumed into the production batch. Every ingredient is required to be traced from the warehouse, to the kit, and into the batch. 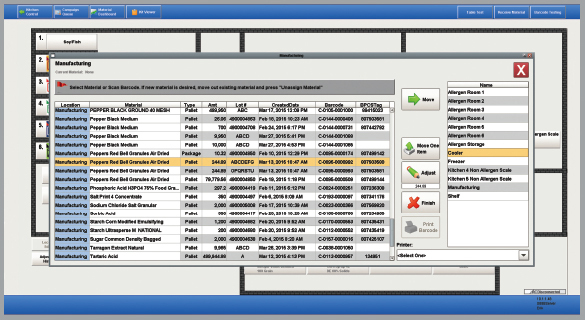 The material management system includes barcode-based scanning and printing, allergen compatibility control, and dynamic inventory management. The main focus surrounding Material Manager is the creation of a ‘partial’ weigh out. Operators are directed to a certain room or location (depending on allergens and material availability) to weigh out a specified material quantity. Occasionally operators will need to move ingredients from one location to another for better organization. They also have the option to ‘split’ containers, move ‘one container’ off of a pallet of containers, and when prompted add the weighed materials to the kit. 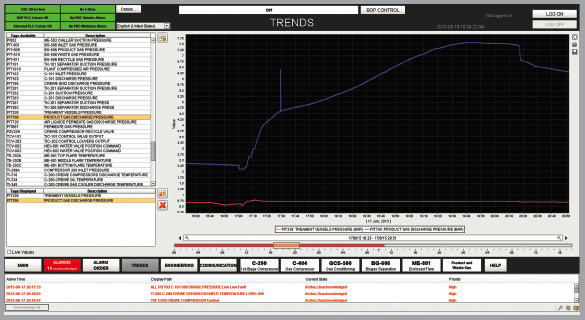 Once the kit is built, it can be viewed and validated from the kit viewer screen. 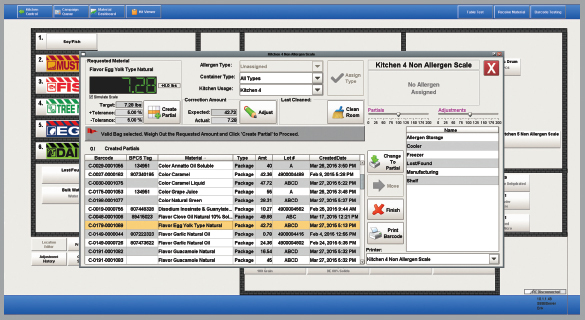 Supervisors have the ability to select specific lines/rows on the ingredient tables, but operators are forced to perform a barcode scan that automatically selects the table row. Ignition gave us the power we needed to create more than an HMI application. Operators and plant personnel don’t just see this as a SCADA system. ECS’ Material Manager is viewed enterprise-wide as a powerful material management platform. Creating an error-proof solution for operators to control an SQL system is far more complex than a typical user interface for controlling machinery. Recipe-based inventory control was an idea that we formed with our customer in the early stages of the project. Because Ignition seamlessly integrates SQL and PLC software, we were able to successfully bring that idea to fruition. Materials received at Pinnacle Foods show up here and are easily transferred to other areas of the plant. When materials are requested, an alert notifies an operator of the material and which room. A kit contains recipes and ingredients that are scanned by barcode.